African elephants are the world largest land mammal, with males weighing up to 6,000kg and standing 3.3m tall. Elephants are also sentient creatures. They live in closeknit family groups, caring for and protecting their young. And, just like humans, they mourn the loss of their family members. African elephants face a risk of extinction in the near future due to a number of threats, including illegal killing for the ivory trade, habitat destruction through human population expansion and agriculture, and subsequent persecution for raiding crops and destroying buildings. Funds from your adoption will primarily support our work with The Amboseli Elephant Research Project, the longest running study of wild African elephants anywhere in Africa. Research from this project has provided valuable insights into the behaviour and intelligence of African elephants that can inform the conservation of this species. You can help ensure their future and other key elephant conservation initatives by adopting our elephant family below. 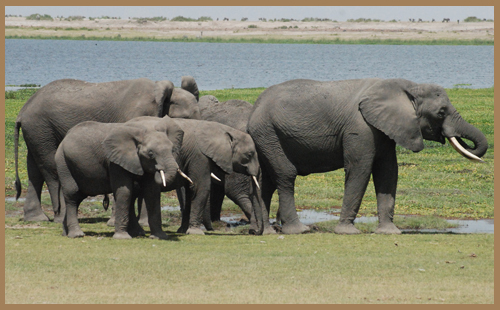 The elephant family live in Amboseli, Kenya and are part of the longest study of African elephants in Africa. Elephants across Africa are under threat from poachers. We must work together to ensure their survival. Help us keep this threatened family safe.